The company now known as AltaSteel was founded in 1955 as Premier Steel Mills Ltd. Before 1955, all steel made in North America was made via blast furnace process from iron ore. 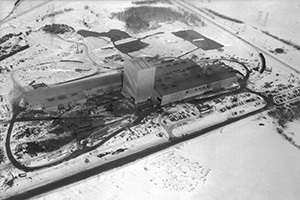 However, by 1955, electricity generating facilities and distributing grids became massive enough to make electric furnace steelmaking practical and economical; Premier Steel Mills Ltd became the first steel mill in North America to use an electric arc furnace process to melt and refine scrap steel and then hot-roll the steel into final product shapes. This process became known as the "mini-mill" process, and represented perhaps the most significant step forward in steelmaking technology in the past 50 years. The mini-mill process now accounts for over 60% of the steel produced in North America. This pioneering effort was recognized in 2004 by the American Society of Materials (ASM), which honoured the AltaSteel facility by designating it as an historical landmark. In 1962, Premier Steel Mills Ltd. was purchased by The Steel Company of Canada, or Stelco, and became known as Stelco - Edmonton Works. 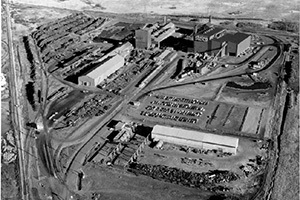 In 1974 various major upgrading operations took place, including construction of the present steelmaking facility and significant modifications to the Bar Mill. 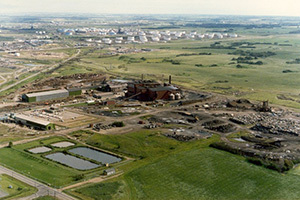 In 1992, Stelco - Edmonton Works was spun off as a stand-alone company known as AltaSteel Ltd. In 1998, a series of capital investments began at the facility - a state-of-the-art steelmaking ladle furnace was brought into operation in 1998, as was a new automatic bundling system in the Bar Mill that same year. In 2001, the Bar Mill's aging finishing stands were replaced with new automated Morgardschammer stands. In 2002 a new Heat Treatment facility was built, utilizing AltaSteel's patented heat treating process for grinding media. In 2006, the Bar Mill was further upgraded with installation of new roughing stands. Also in 2006, Stelco completed the sale of AltaSteel to the Scaw Metals Group of South Africa. In 2011, Arrium Limited (formerly known as OneSteel) acquired AltaSteel and merged the business with its international Moly-Cop Group of companies. In 2017 American Industrial Partners (AIP) acquired the Moly-Cop Group of companies including AltaSteel Ltd. and changed the name of the legal entity to Moly-Cop AltaSteel Ltd.; however continuing to do business as AltaSteel. AIP is a US based operationally-oriented, middle market private equity firm that is distinctively focused on industrial businesses.